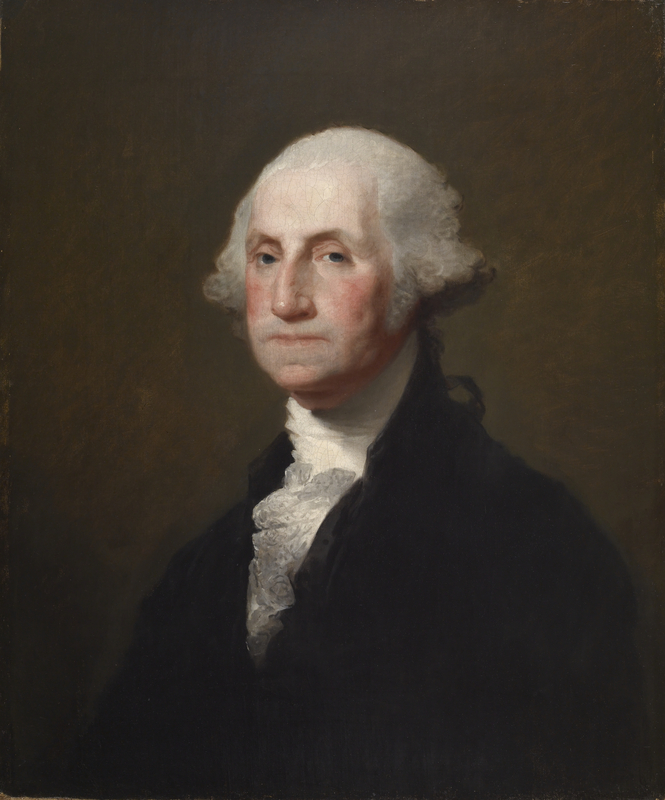 Happy Birthday to George Washington. The “Father of Our Country” was born February 22, 1732. 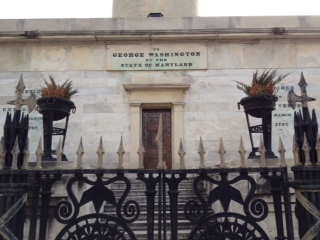 There are lots of places with connections to George Washington, so you know we’ve encountered him on a Nerd Trip or two! First of all, I live in Baltimore, home of the first “Washington Monument.” Every year the city holds a special monument lighting, when they turn on the holiday lights, strung from the base to the top. I’ve always wanted to go, but never seem to make it. In honor of President Washington, I stopped by the monument this morning to take a few pictures. Crews started building the monument in 1815 and finished the 178 foot Doric column in 1829. 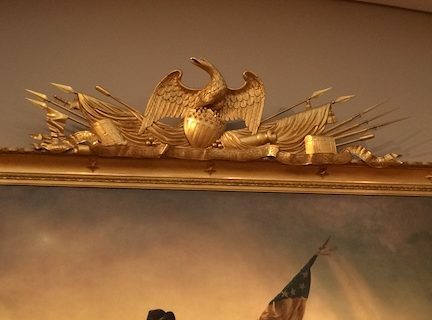 Washington stands atop the column with his arm extended holding a scroll, although many people think it looks like something else from a certain angle. The area surrounding the monument is appropriately called “Mt Vernon,” which is also home to the Walters Art Museum, where I volunteer. 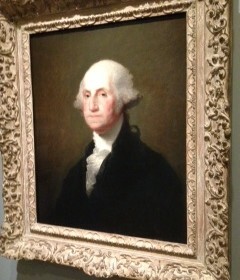 The Walters has a wonderful Gilbert Stuart painting of our first president. The Walters has spent a lot of time putting its collection on the website, so you should check it out or come visit the museum! 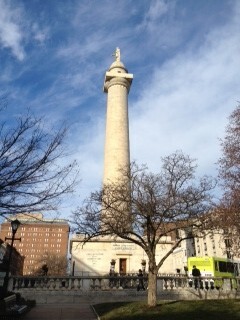 Here’s something I never noticed before about Baltimore’s Washington monument. 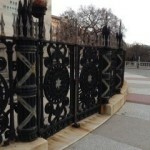 Look at the cool gates/fence surrounding it! 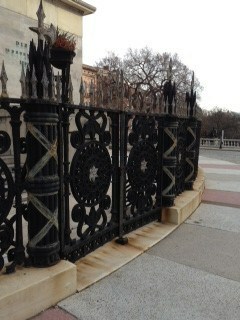 It’s very military-like with axes on some of the posts. The guy replied, “It’s not a monument for Denzel, but he’s a really good actor.” I agreed that Denzel Washington is a good actor, but felt a bit bad for George getting somewhat dissed by a guy right in front of his own monument on his birthday. But, that’s part of what I love about Nerd Trips, you meet some kooky people (with and without teeth)! And speaking of teeth, another Baltimore connection to President Washington, we have his teeth! Actually, the National Museum of Dentistry has a pair of them (And, they are hippopotamus ivory, not wood). While I enjoy visiting presidential sites, I confess that I have missed this one right in my own backyard. For five years, my office building was literally next door to the National Museum of Dentistry, and I never went to see Washington’s famous choppers. I plan to rectify that soon. So happy birthday George Washington! The guy on Baltimore’s Mt. 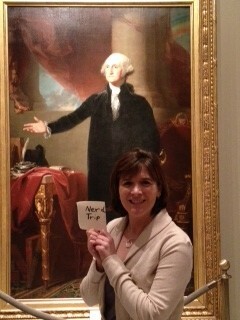 Vernon square may think of Denzel first when he hears the name Washington, but you are first in our book! Who is Severn Teackle Wallis? Come along on our scavenger hunt through London to discover statues of U.S. presidents. This time we track down the bust of President John F. Kennedy, which you'll find on a busy road near Regent's Park.